August 28. 2012 | By Valerie C.
It’s been a little over a year since we last heard Mountain View’s Dogcatcher. With frontman Andrew Heine and drummer Ramon Esquivel having expressed the desire for crafting songs that would make people “move,” it’s only natural to assume that a few changes were in store. Having parted with their original bassist and adding Ryan Kingsmith (accordion) and Jared Milos (bass, trumpet) to the band’s current lineup, the boys got to work and the result is their latest EP, It’s Easy. While KILR, the band’s previously released LP was infused with pinches of blues and jazz, it was largely folk influenced. This six-song EP gives us a nice taste of the band’s next evolution. “Be Easy” is a jazzy rock number that’ll have you swaying in no time. Heine’s ivory tickling is the stand out on the sprightly rock groove of “I Need You.” The bossa nova-ish flavor of “The Stone” is quite lovely. Closing with the soft pop/R&B sway of “Sezio,” Dogcatcher are clearly unafraid to breathe in other genres seamlessly into their indie rock/pop fold. One caveat would be to pay attention to lyrical depth. 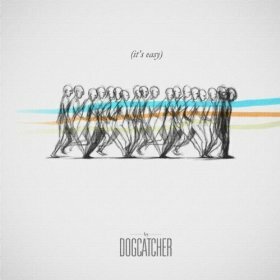 Still, on It’s Easy, Dogcatcher seem to be a lot closer to/or on track to solidifying their sound.